I settled into my seat and flipped through the bulletin... seeking a glimpse of what God had in store for me this Sunday morning. A hymn I love, one I don't, a scripture I had never read... and then the Gospel Lesson. The beatitudes. I could feel the sigh slink out, and then the smile that snuck up on my face. 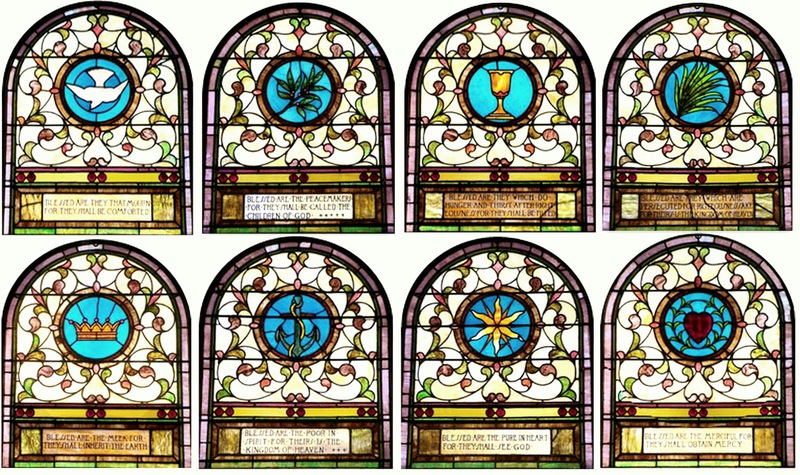 The beatitudes are some of the first verses I ever read... not on thin almost-see-through pages, but on colored glass around the church that was my start. A girl of ten doesn't quite give her full attention to the speaker before her, and seeks distraction to fill the time. Daydreamer that I have always been, my eyes would always flee to the window. Church was no different... except that I focused on the window itself rather than what was just beyond it. The colors and the swirling vines delighted me, and the words etched themselves within me. And even though I didn't quite understand them, I felt like we were kindred spirits, those window-words and me. Blessed are the poor in spirit for theirs is the kindgom of heaven. Today, I find comfort in those words all over again, and with a lot more life behind me, the words stir my spirit and shed light on what is real, where my heart needs to be. I know that my spirit must cling to God, because I need my Savior. When my heart breaks over the world, it is in Him I can find comfort... peace. And am I meek? I have always believed so... and pictured my shy self peeking from my hiding place in the dark. But His Light tells me meekness is humble patience... strength under control. Strength not for my will, but for His purpose. Maybe I need to take a step closer to meek. And I am sure, at ten and twelve and twenty, I did not have an inkling about hungering or thirsting for God... but now, most days I crave Him. I long to be more like Him, and show my little world less of me. I yearn for the pureness that is Jesus. And peace? I yearn for that, too. At every turn. I am years and miles and so many states away from the church where I began... but the steeple that reaches into the sky, the sturdy wooden banister that rounds around the bell rope, the altar where I made promises for my life and the windows that declare me blessed will forever be... a part of me. Oh I like this story, Dawn. I like the thought of you as a ten-year-old, mesmerized by those colorful panes and God-window-words. Nicely done. Just how exactly did I get behind on reading your posts? How did that happen? Somehow I almost missed this one. Thank goodness I scrolled down and caught up. . . because this one is too good to miss.